Begin by speaking to the Mayor of Nardah, found southeast of Pollnivneach. To start the quest, take the desert carpet from the Shantay Pass to North Pollnivneach and from South Pollnivneach to Nardah. East in the town is Awusah the mayor. 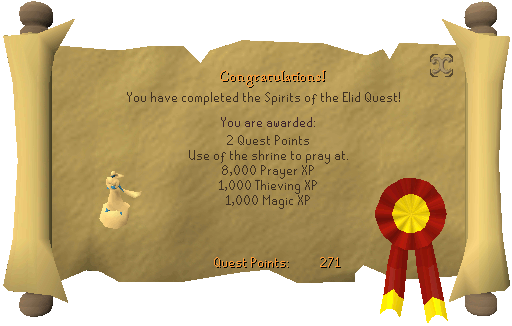 Speak with him, ask him for quest, and he will say that the village has come under a curse, because a Saradomin Priest came to their town and was found dead by the river one day. Speak to Ghaslor the Elder, who is in the House just north of the mayor's house. You will be informed that The Spirits of Elid Aliment the river itself, and nothing has passed at the river without them knowing. 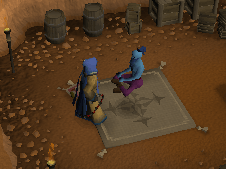 Ghaslor will also give you a Ballad Scroll. Read it, and it will tell you about the Monsters and an Ancestral Key. Go to the Museum right beside Ghaslor's house and Telegrab The Ancestral Key. It can be attached to your Steel Key Ring. Search the Cupboard to find a Torn Robe Bottom and Top. Repair them with a Needle and some thread. Now, bring a Crush weapon (Mace, Mauls, etc), and a slash and stab (Dagger, Battleaxe, Sword) weapon with you. A spear can be used for all three attack styles. Follow the river that is directly west of the town, and north to the end until you see a (!) Sign. 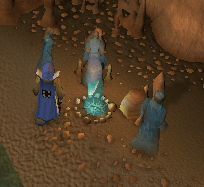 If you must go back to Al Kharid, the cave is directly east of the Shantay Pass. Don't forget your rope, your key and your robes. 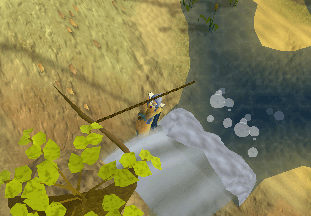 If you didn't bring a Bow and arrows and a pickaxe, there is a Shortbow right near the cave, a pickaxe near the river and arrows near the bridge. Use your rope on the Root, and you will be inside the cave. Put your robes on, and use your key on the door. You will find a room with 3 separate pieces. There are 3 doors, each protected by a Golem. They should be easy to defeat, they attack with Melee and they don't hit hard. If you want to check the attack types of each weapons, you can check in the Attack Guide. The White Golem Guards the Thieving Room, and can be defeated by a Stabbing Weapon (a Dagger). 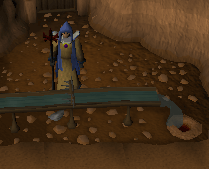 Your job is to let the water flow, by fixing the trap with your Thieving skill. The Gray Golem guards the Mining Room, kill it with a Slashing Weapon (a sword) and unblock the rocks with your pickaxe. The Black Golem is the one mentioned in the Ballad, kill it with a Crush weapon (a maul or a mace) and shoot the Target with your bow and arrows. Once all three water systems are flowing, the second big door will open. Follow the water stream, and you will see 3 Elidinis Water Spirits. They speak as if their minds were one. They claim to have rid the Saradominist priest and also claim to be responsible for taking the water away from the citizens of Nardah as well. 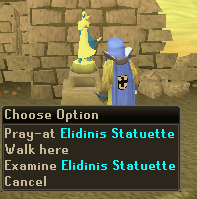 They say that they won't lift the curse as long as they don't get their statue of Elidinis back and worship it. Head back to Nardah and Speak to The Mayor. He says that the Statue was thrown down in a Crevice in the desert west of there. Pick up his Shoes. Head a bit west of the town and you will see a Crevice. Climb down and you will be in a room full of snakes, and there is a door to the north. Go in that room and you will see a Genie! Ask about the Statuette that was thrown down in the Crevice, and he says he will trade it against the soul of the Mayor! He even says they can be easily removed with a knife! Actually, you need to get his Shoe Soles. Use your knife on the Shoes you picked up earlier to get the Soles. Go back to the genie and give him a sole for the Statuette. Bring back the statuette to the mayor. He will tell you to place it on the Plinth in the temple, And the quest will be completed!